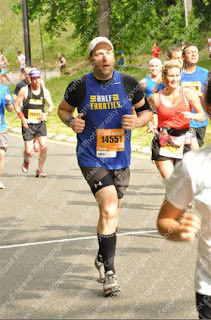 Reflecting back on my goals for 2012, my spring goal race was a half marathon. My objective at the time was to break 1:50:00 (which would represent a 5+ minute PR for me). The Long Island Half marathon was to be my goal race. Unexpectedly, I was given a last minute opportunity to run the NYC Half, which is a race I had run several years ago, but haven't run since. It's a huge race, but the second half of the course is net downhill. Of course, I jumped at the opportunity. Sparing you from having to read through an exhaustive race report, I had a great race, and achieved my spring half goal with a 1:48:59 finish (thanks in part to the huge boost I received from Abbe in mile 12). Needless to say, I was thrilled with my time, and went into Long Island with the stretch goal of breaking 1:45:00. Due to some GI Issues early on in the race, and an unexpectedly humid morning, by Mile 3 I knew that 1:45:00 wasn't happening. I settled in for the long haul, and hope to at least beat my time from NYC. Unfortunately, I couldn't get my hydration right, and was fighting back the urge to vomit. By mile 8, I stepped off the course, actually hoping to be able to puke and get back to it. A runner passed by, and encouraged me to get back and start running. I did, and eventually felt better. The race was long and the scenery was nothing spectacular. Without music (another conscious decision), I had little to take my mind out of the race. I slogged it through the miles, and worked to the very end. In mile 12, we re-enter a park (where we started) and go on a long, meandering path to the finish. I recalled looking ahead, tracing the curves with my eyes, in utter disbelief that people SO FAR AHEAD of me were still running. The finish line was nowhere to be seen. I pushed and I pushed, until FINALLY mile 13 arrived. I put the hammer down, and sprinted the .1 miles to the finish. Next up: My first triathlon, the Olympic Distance Red Bank Triathlon with Matt and Scott. Goal is to finish, have fun, and learn as much as I can as I prep for my first 70.3, the Rev3 Maine Triathlon. Have fun!!! I started tris last year after being sidelined from running injuries the year before. I think they are so much more fun than a running race could ever be; it's a totally different environment. That said, I thought about Rev3 Maine too, but I was dissuaded by the fact that the water is going to be FREEZING! Be sure to have a full-sleeve wetsuit that you practice in a lot!